We are pleased to offer these specially priced American River rafting trips for the entire family. This is your opportunity to share the outdoors with your children so they might learn to value these wilderness areas and work to preserve them for future generations. Oh, and your kids will be thanking you for the most amazing adventure vacation yet! We offer many different options for families with kids 4-16 years of age. From our Family 50% Discount trips to our Young Rafters Trips (ages 4 and up) and Young Rafters Overnight Adventure, finally to our Sunset Cruise Class 2 trip on the “Lower Section” of the North Fork of the American river, just below the town of Auburn, CA. Pick one below and experience a wonderful adventure with your entire family. Check Availability for your next Family Rafting Adventure. Call at 1-800-750-2386 to learn more about this outstanding family vacation opportunity with Whitewater Excitement. Request a reservation today! – Our Family American river rafting trips are affordable vacations you won’t want to miss! 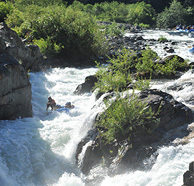 Weekday South Fork American River -Raft either our Half Day Run, Gorge Run, or 2 Day Trip. Receive 50% off each child under 16 with a full paying adult. Use Online Reservation Code: Family – when making your reservation online. Children aged 16 years and under will get a 50% discount when accompanied by an adult paying full price on our South Fork American Half Day Express Trips, Gorge Run, and Two-Day American River rafting adventures. These trips are offered Monday – Friday during the months of June, July and August. 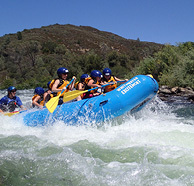 A great way for the whole family to experience the joys of California river rafting and camping. An experience that you and your family will never forget. Even your teenagers won’t be able to resist it! It is difficult these days to find activities that the entire family can enjoy together. California whitewater rafting is the adventure you’ve been looking for! It’s affordable, close, and we guarantee that you’ll have fun! 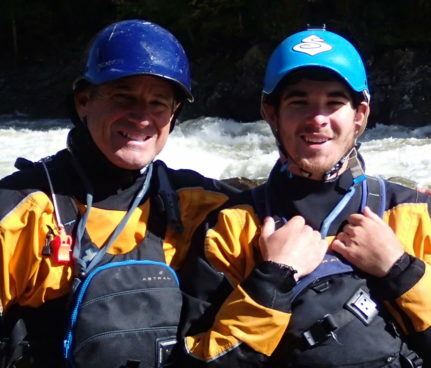 Great Adventure for the Younger Rafters – Spend a half day rafting the “Middle” section of the South Fork American River with your youngsters. Bouncy, fun, class 1 and 2 rapids. Time to swim and enjoy the river. Our Young Rafters Adventures are for families with kids that are too young for our regular rafting trips. Easy and fun rapids that will give your younger rafters a taste of whitewater rafting. We begin our trip at Coloma State Historic Park, where gold was first discovered, and finish 5 miles downstream at our South Fork Basecamp. For families with younger kids, ages 4 and up, this is a great way to introduce them to rafting. This river rafting trip has bouncy, fun, and exciting class 1 and 2 rapids for the younger ones. There is time to relax, hop out of the raft for a quick swim in the river, pick blackberries, and soak up the awesome scenery of the South Fork of the American river. A perfect amount of time for everyone to have a great time on the river. At the end of the day, cold drinks will be waiting for you at our South Fork Basecamp where your adventure ends. Your guide(s) will be there to thank you for coming and help you get your little ones back into some dry clothes for the trip home. Add Camping to your Young Rafters Adventure – Come in the night before your trip and spend the night camping, have a great BBQ Dinner, and raft the next day. A great way to introduce your youngster to camping! Our Young Rafters Overnight Adventures are for families with kids that are too young for our regular rafting trips. 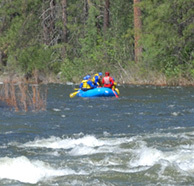 Easy and fun rapids that will give your younger rafters a taste of whitewater rafting. We begin our trip at Coloma State Historic Park, where gold was first discovered, and finish 5 miles downstream at our South Fork Basecamp. For families with younger kids, ages 4 and up, this is a great way to introduce them to rafting. This river rafting trip has bouncy, fun, and exciting class 1 and 2 rapids for the younger ones. There is time to relax, hop out of the raft for a quick swim in the river, pick blackberries, and soak up the awesome scenery of the South Fork of the American river. A perfect amount of time for everyone to have a great time on the river. At the end of the day, cold drinks will be waiting for you at our South Fork Basecamp where your adventure ends. Your guide(s) will be there to thank you for coming and help you get your little ones back into some dry clothes for the trip home. We spent a week in N. Calif – sightseeing in Yosemite, S. Lake Tahoe, etc. and I have to say the trip we took with your company was a highlight of our week! What made it so fantastic was your wonderful guides – they were experienced, friendly, and funny – (we spent some of the trip exchanging jokes!) The trip was exciting for our boys, but at no time did we feel unsafe (a plus for me since I was a first-timer and a bit of a chicken). They explained every rapid and threw in some interesting stories. Our trip included a beautiful riverside lunch – complete with fresh, sliced (delicious!) fruit, and dessert. There were NO complaints from us – the best part of our trip was the experienced guides. Thank you again for the memories of a great family vacation!